I purchased this at one of our local grocery stores yesterday and had it for lunch today. Read to find out what I thought of it. Product Description: Instant soup bowl from the Bear Creek Country Kitchen brand. The product is prepared by adding water and cooking the soup in the microwave for 2 1/2 minutes. I purchased this at one of our local grocery stores yesterday for $1.49, prepare it and had it as my lunch earlier today. I saw this product at one of our local grocery stores a couple days ago and, at the time, decided not to buy it. 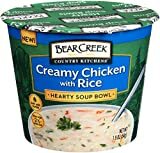 However, I've had other Bear Creek products in the past and realized I was somewhat curious about a single-serve option that could be prepared in my microwave. So, while at the store yesterday evening (picking up some pizzas for National Pizza Day), I decided to buy a couple of these, one for me and one for my wife, to try. I ended up preparing my Bear Creek soup bowl while home for lunch today. And, after having it, must say I was much more impressed with it than I thought I would be. As far as preparation goes, it was very similar to making a cup of instant noodles in the microwave. All I had to do was add water, cook it for about 2 minutes, stir and cook it again for another 30 seconds. Even without letting it sit for the recommended three minutes (I just didn't have the time), it came out fully cooked and nice and thick. One of my biggest concerns about this product was the flavor. Based on my experience with other instant soups, I was expecting this to be very salty. That, however, was not the case. There were just enough seasonings in it to give it flavor and, other than the cup it came in, nothing (at least as far as the taste is concerned) would make me think it started out as a powder. The soup also proved to be much more filling than expected. There wasn't a lot of chicken or vegetables in it. But, the broth was thick enough to make it a satisfying lunch. In fact, the only real complaint I had about this product was the cup it came in. That actually ended up being quite hot when it came out of the microwave, to the point I couldn't hold it while eating and had to pour the soup into a bowl. As a result, I wouldn't recommend this product if you have to hold your lunch while eating it and don't have an alternative dish to put it in. I had some doubts about this product when I first purchased it. But, it proved to be a surprisingly tasty and filling lunch today. If you have an opportunity to try this product, I would recommend it. I purchased a couple cans of this product yesterday. Read to find out why I wasn't impressed with it.